Located in the Mabale communal lands on the edge of Hwange national park, Zimbabwe, the Soft Foot Alliance (SFA) seeks to support the holistic management of this landscape. The Permaculture ethics of earth care, people care and fair share guide its work in creating solutions that support people and wildlife to live side by side. In the two years that it has been operating, SFA has offered a range of training opportunities. It has taught 300+ women how to make their own rocket stoves; has facilitated Permaculture training and site visits for community members; and has offered support in implementing passive rain water harvesting. 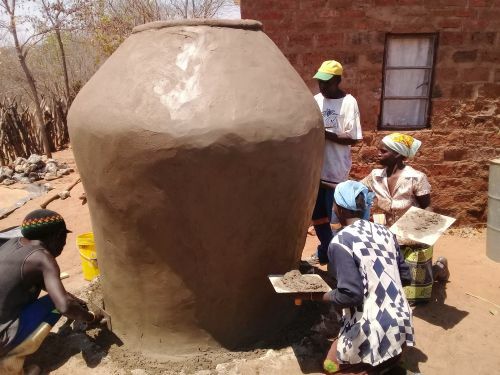 It has trained local builders to create ferro-cement rain-water tanks and rain Jars for homesteads and has offered training for herders and women in making predator-proof mobile livestock bomas (that also result in improved land fertility and crop yields). Barefoot beehive construction has also been used to protect fields and gardens from elephants. SFC has helped establish Kulisumpula Beads (a 15 women co-operative making beads from recycled glass), and SFA has partnered with Bio-Innovation Zimbabwe to train in the collection and pre-processing of indigenous nuts and seeds and the propagation of these trees in two wards around Hwange national park.